It was a great home away from home. The rooms and bathroom are huge, attractive and comfortable. The staff was very nice and helpful but some people do not speak any English. I would highly recommend this place for a great value. Extremely helpful and friendly staff. Great location 2 minutes walk to the beach and many great restaurants. Quiet and away from the main town but a quick car ride or 20 minute bike ride on bikes provided free. 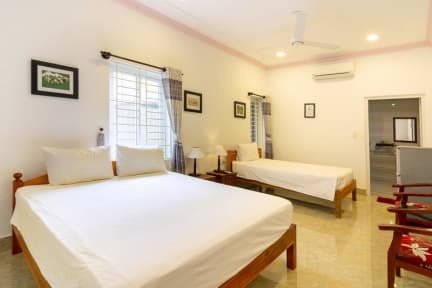 Big comfortable rooms and beds and huge bathroom. Basic good breakfast. If you want a place near the beach, stay here! Such a lovely place to stay, liked it so much that we extended our stay by a couple of days. Minutes from the beach and lots of nice places to eat. The staff are also all so sweet and helpful!! Awesome location, great and helpful staff with cheap scooters available! 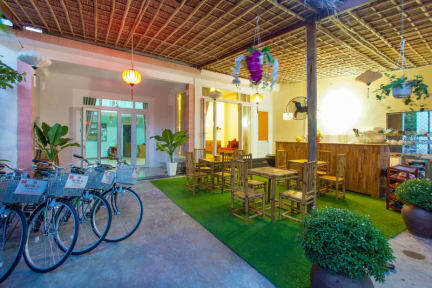 Cheapest single rooms on the beach in Hoi An. halfway between a nice secluded beach and a more commercialized stretch with nice bars. This is not a place to socialize or anything, just a nice bed for the night. We had an amazing stay at this hostel. Clean and spacious rooms. Very safe. Perfect location!! Less than 5 minutes by walk from the beach, nice restaurants and spa. Takes about 15 minutes to get to old town in taxi. Very welcoming staff although limited english. Would definitely recommend if you are looking for a peaceful environement, away from the crowded cities of Vietnam!! !